Stream anime episodes online for free, Watch One piece Episode 66 English version online and free episodes. Anime Episode guide One piece Episode 66 English dubbed Luffy vs. Zolo” / “All-out Battle! Luffy vs. Zoro, Mysterious Grand Duel! Mr. 5 and Miss Valentine follow after Vivi, who attempts to flee the island. Igaram, no longer able to fight himself, begs Zoro to save her, but Zoro refuses. As the Alabastan soldier promises a handsome reward, Nami chimes in. She first extorts Igaram to raise the amount, then she extorts Zoro to save the princess. When Zoro is about to take on Vivi’s assailants, Luffy appears. 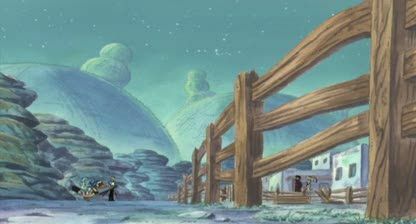 Oblivious to the townsfolk’s occupation as bounty hunters, he wants to kill Zoro for cutting them all up. Unable to convince Luffy of the truth, Zoro fights him. The officer agents attempt to get past the fighting crewmates, but are caught up in the struggle and easily defeated.